Discussion in 'Trek Tech' started by Arpy, Jul 11, 2016. Anyone else love Jackill's fan-designed starships like I do? I've loved his books since finding them at conventions years ago and basically think of some of the designs as "canon" in my Trek universe. Erik has a Facebook page devoted to all sci fi blueprints, so the fun continues. A lot of his designs have been inspirations for my own kitbashes. They've long been a favorite of mine as well, though it took many years for me to actually track down the books. Long, painful years. 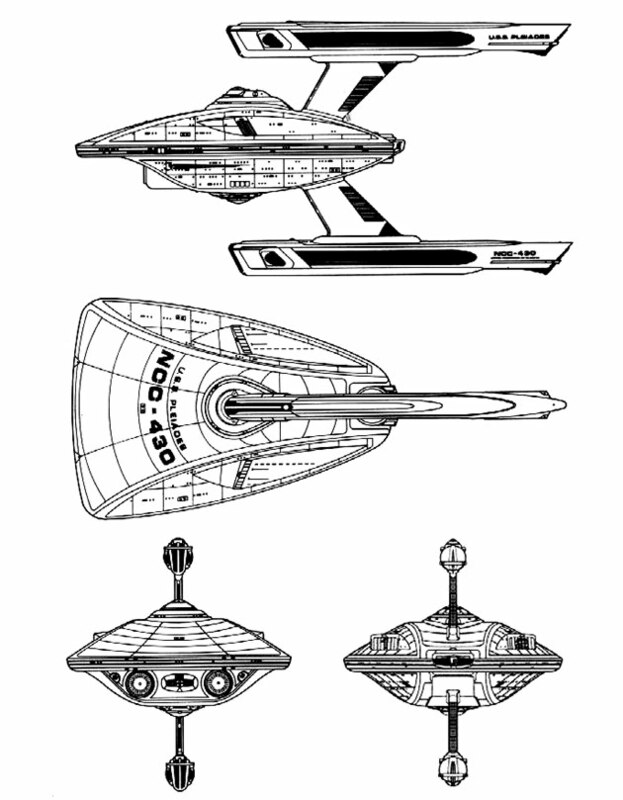 It's nice to see expanded design families for the Oberth and Excelsior aspects, and I'm inclined to think (per my own headcanon anyway) that many of the V3 ships were entering service around the turn of the 24th century and perhaps at least the first decade or so, when the Excelsior would have proven itself a good workhorse. I love the Aztec Class Type III [mobile] Dry Dock as well. It's a bit too military (Dreadnought, Battleship, Destroyer). And some don't mesh with the Trek we think of (Hornet Class *Fighter Carrier), but it's good stuff. 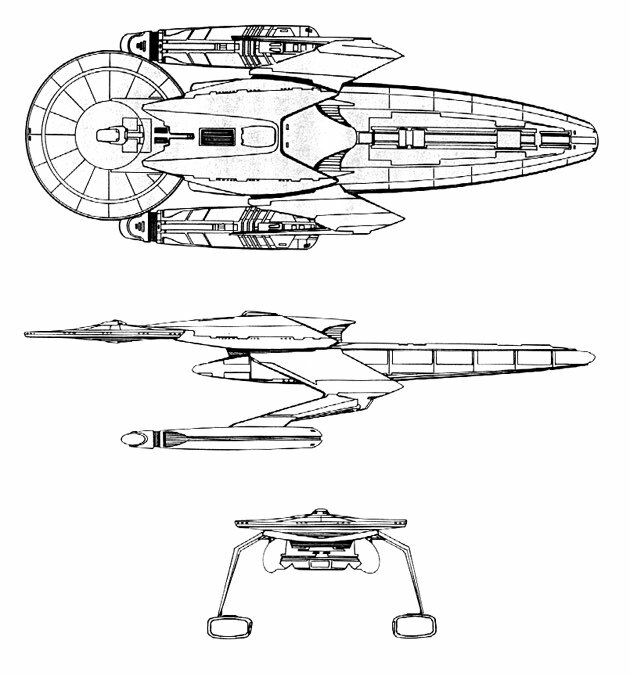 Some are interesting in-betweens (Dakota Class Heavy *Shuttlecraft Carrier). Some classifications have a ring of nautical rightness to them. 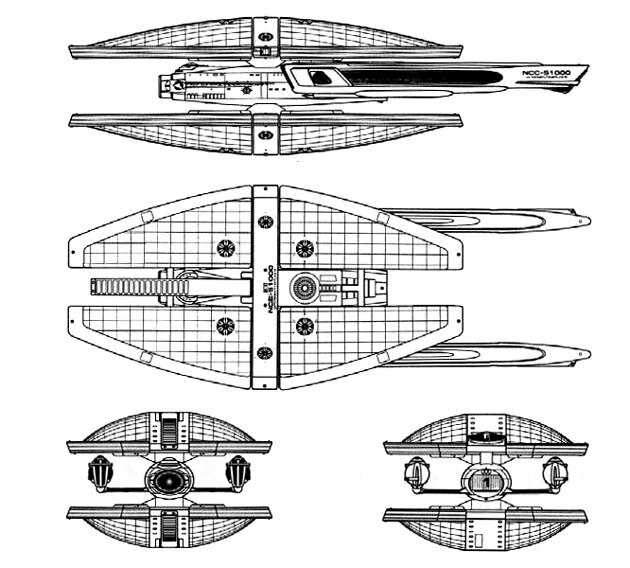 In a fleet were [canonically] larger ships are classified as Cruisers and mid-sized ships are classified as Frigates, nautically, it should be smaller ships being Corvettes. One corvette is the Stormbringer Class. Smaller ships don't need the extra space of a large saucer attached to the stardrive. And in ships like this, Jackill gives us another kind of starship configuration to play with -- like the alternatively mono-hulled Reliant or Stargazer, the neckless Grissom, the sphere-headed Pasteur, the three-nacelled dreadnaught, or the square-bodied Jenolan. I don't really mind the military aspects, though I do agree there's a heavy emphasis on those. 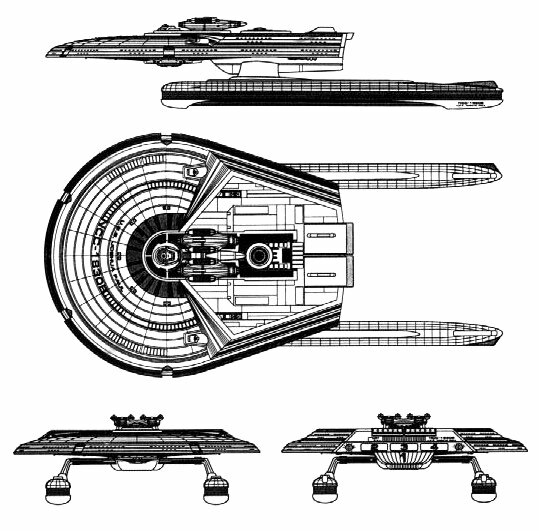 I think it's logical for Starfleet to build a small number of dedicated tactical vessels like dreadnoughts, and that a dreadnought could easily fill the role of several cruisers or destroyers in a more volatile area of space. I've always rather liked the Huntington class fuel carriers. I just tried Googling it and don't see it. Was it in a book? V3. Huntingon Class Unlike many of his designs, there doesn't seem to be a separate set of ship sheets for it. Oh, that's the Huntington Class... Almost included it in my earlier post. I like. Thanks a ton for the Facebook page! I've been sorting through it and nerdgasming reviewing designs. I thought you might be a fan when I first came across inpayne years ago. I'm a fan of yours as well. In fact, I saw Colusus: The Forbin Project because of you and one of your old profile pics with Eric Braeden. S.S. Reeses - one of my all-time favorites. This happened between Daedalus and Constitution. U.S.S. Preble - another all-time favorite. Love the organic feel of it. Perfect for the Galaxy era. Better than some of the Wolf 359 ships. The Romulan Seabird is delightful. The U.S.S. Coeur de Lion is the ultimate physically modeled uber-ship...I tip my hat to you. Colossus was an amazing book and movie, when seen thru the eyes of a child of the cold war and a Trekkie! My USS Terrell is a direct inspiration from one of Jackill's designs. I didn't quite copy it, but he could probably C&D it on me . And the Kirov sort of takes elements from several of his Excelsior-based dreadnoughts. I admit that while it's not a Jackill's design, I've always had a soft spot for FASA's M'Benga class medical ship. One of their better designs IMO. blergh. I always hated the FASA TNG era ships. That book was, I feel, FASA at its goofiest. The M'Benga could have been cool with more conservative nacelle pylons. The M'Benga could have been cool with more conservative nacelle pylons. 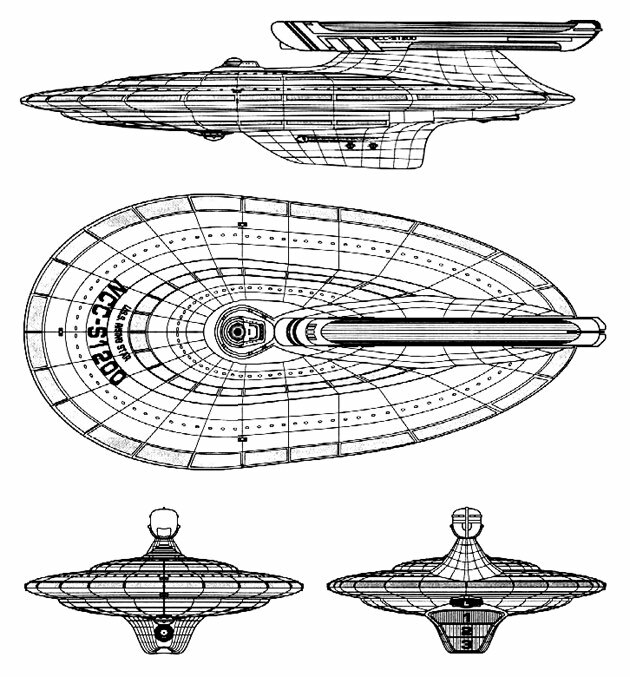 Maybe it needed adjustable nacelles like the Intrepid? I like the Podesti as a film era cruiser, as a complement to the heavy cruiser Enterprise. The only thing I'm not terribly fond of is the torpedo bay stuck on at the bottom of the secondary hull. I think I would have preferred the launchers to be integrated a little more organically, somehow. I've got Volumes 1/2/3 Had them forever. I have all Jackill's books, even the ones he no longer sells on his site. The only criticism I've ever had about them is I wish the ships had been named a bit more Star-Trek creatively. Although that particular problem is MUCH worse in SFB. Seriously, they named ships of one class after Saddam Hussein and Slobodan Milosevic. Come to think of it, I named one of my bashes Kirov, just because it's a cool-sounding name, despite him being a commie politician from a state that no longer exists . My only criticism for Jackill would be that he seems to put an arboretum into every single ship. Seems to me that it's not something that every ship would have room for or need for. In fairness to you, Kirov is also a bunch of place names in Russia and other countries, and two classes of warship (cruiser and battlecruiser). And a ballet school! Perhaps Jackill has always been a big fan of Silent Running?